I’ve been looking forward to this moment for a long time. The Water and the Wild series holds a tremendously special place in my heart. The Water and the Wild was the manuscript that got me my very first agent and book deal. It was my debut novel, as well as a tribute to my favorite childhood stories. I was so grateful for the chance to continue Lottie’s story in The Doorway and the Deep. And now we’ve come to the end—the final book, the last chapter. I couldn’t be more excited that Erwin Madrid, talented illustrator of both The Water and the Wild paperback and The Doorway and the Deep hardcover, agreed to illustrate this final cover. Long-time readers will notice some changes in style and fonts, and since Book 3 is a self-published project, there will be more of these changes within the book. I’m sorry that I can’t give you readers a perfectly cohesive trilogy style-wise, BUT I’m so glad that you can at least have three matching covers; this was one of my top priorities. Now for the second reveal of the day: an official pub date! 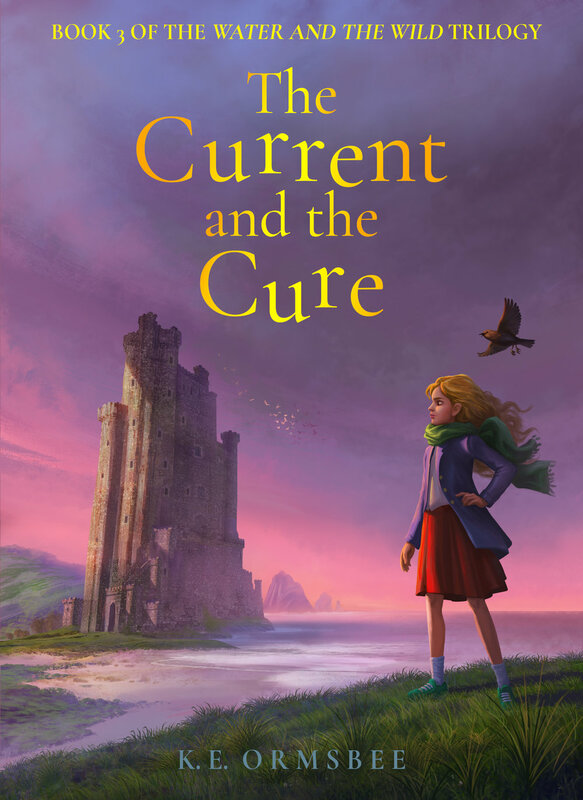 The Current and the Cure comes out June 12, 2018. It will be available for purchase as both an ebook and a paperback on Amazon, and you can now add it on Goodreads. Lastly, I know that June 12 is still a ways off, so I’m sharing a little extra something with you: a sneak peek at the first few pages of The Current and the Cure! A yellow apple tree grew in the heart of the Northerly Court. Its roots dug deep into rocky soil, and its branches reached toward a shimmering sky of mirrors and stone. The tree grew deep underground, reachable only through the narrow passages that led from cavern to cavern. It was the most guarded possession of the Northerly sprites, and now, in a time of war, it was more closely guarded still. Where there had once been a post of six guards, a dozen now stood, armed with spears and shields. Though Iolanthe was bound to the sea, her underworld soldiers were on the move, and her spies could be found lurking in the most unlikely of places. In days like these, there was no telling if a fellow sprite was friend or foe. There were even rumors that some of the Barghest had joined her side, and with no Heir of Fiske to command them, what was to be done? Whispers and rumbles surrounded the tree and floated out, into the sunlit world above. There was a charge in the air of northern lands. Blood had been spilled in the Northerly Court, and now the whole of Albion Isle was at war. Soon every part of the island would feel the effect of King Starkling’s world gorge. This was not a time for cheer, nor for mindless melodies. And yet, at the base of the yellow apple tree, a boy was whistling. He hovered upright, a good foot off the ground, and though he carried himself like a wisp, any of the guards could see the Northerly mark—a black diamond—tattooed upon the boy's right wrist. As he blew out his pleasant melody through puckered lips, he drifted upward a few inches more. Fife Dulcet was waiting for someone, and that someone was late. His presence was unappreciated by the guards. Those closest to him looked on with sullen stares, but the orders from Rebel Gem remained: This halfling and his Southerly companion were to be allowed access to the tree on classified business. The guards did not question their leader’s command, but they certainly did not obey so much as endure it. The boy named Fife broke off his whistling suddenly. “Well, this is getting ridiculous, huh?” he asked the guards. The guards said nothing, too busy with the simple task of tolerating the halfling's presence. Some sprites called him a royal, but many more whispered that he was illegitimate—the son of a roving Northerly scout. One could see why he wouldn’t belong with his mother’s people in Wandlebury Wood, but it was just as clear that he didn’t belong here, in the sacred court of the North. Fife began to hum. He produced a chain of arpeggios as he slowly flipped in mid-air, turning over and sending his shock of glossy black hair flying. He flipped again, and this time, just as his head hung directly over the ground, the yellow apple tree began to move. The brown bark of the trunk shifted and whorled, spiraling out until an opening appeared at its center. Once the opening had grown as wide and tall as a full-grown sprite, a figure emerged from it—not a full-grown sprite, but a girl around Fife’s own age. She had long brown hair, a radish-shaped face, and a snub nose that she now turned up at the sight of the floating boy. “W-whoa!” said Fife. His hovering faltered, and he fell to the ground in an undignified heap. “Sheesh, you’re the one who was late. And everyone here’s a bore. I had to entertain myself someh—” Fife stopped short as he righted himself and got a good look at Adelaide Wilfer’s face. Her eyes were red and watery, her cheeks blotched all over. Even now, new tears were leaking from her eyes. She hurriedly wiped them away, only for new ones to take their place. “Oh,” Fife said, swallowing the rest of his words. “Well,” said Adelaide, with a quivering voice, “what did you expect? It’s not like I wanted go. And I hardly think it’s fair to have made me do it, just because I'm better with adults." “You said you were okay with it,” Fife said lowly. “Yes, well, I was wrong.” With that, Adelaide burst into a fresh bout of tears. Fife looked on, alarmed and horribly uncomfortable. He floated forward, cautiously reaching out his arms. Then, with care, he wrapped them around Adelaide’s shoulders. He expected a shriek, or for her to throw him off. Instead, Fife felt the pressure of two fists on his back as Adelaide willingly held him and cried harder. It was the second hug of Fife Dulcet’s life, and he was glad, at least, that his first hadn't been as distressing as this. Adelaide did not go on, and Fife hardly felt like finishing the sentence for her. The unspoken possibility was too awful: Eliot, Lottie, and Oliver were probably . . . dead. Who survived a fall into a world gorge? The answer to that question was an unthinkable reality, and these days, Fife chose not to think on it at all. He couldn’t. He couldn’t lose his very best friend. He couldn’t lose Lottie without apologizing to her for his stupidity. He simply couldn't. “Mr. Walsch said we must hope,” Adelaide whispered. “I don’t feel like hoping,” Fife whispered back. Fife was about to comment on Adelaide’s interesting choice of words when someone cleared his throat. That someone was standing in the doorway—not a guard, but a boy their own age, with a full head of snow-white hair. “You’d better come quick,” he said. Fife and Adelaide exchanged a glance, and in it was all the worry that had been building in them for the past three days. “We’re coming,” said Fife, hovering forward, Adelaide at his side. Only after they’d followed Thwaite out of the room did a chirruping sound fill the air. The apple tree’s twelve guards looked up, on alert, at the sound of a warbler’s call. The sun winked off the mirror-lined ceiling and caught on the wing of a small black bird, who was descending toward the tree with grace and speed. “Steady, sprites,” said the captain of the post, as the other guards gripped their spears and readied their feet. For this particular bird had a knack for getting himself into trouble. This bird was the genga of Lottie Fiske. Readers, thank you, THANK YOU for going on this journey with me. This endeavor has been a labor of love and certainly tough at times, but we’re that much closer to publication! I cannot express how grateful I am for all your patience and support. More from me and the land of Limn very soon.